Welcome to the Oxford Witney Four Pillars Hotel, home to sought-after meeting rooms in Oxfordshire. 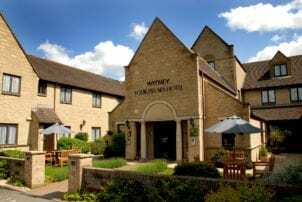 A smart 4-star hotel just a short walk from the historic centre of Witney, the hotel is centrally located near Oxford city and benefits from an easy-to-reach location in the heart of Oxfordshire, just off the A40. Features complimentary Wi-Fi, contemporary décor and plenty of natural night in all meeting rooms, as well as access to private parking for delegates. Book this venue or let us help you find more perfect Venues in Oxfordshire for your event.